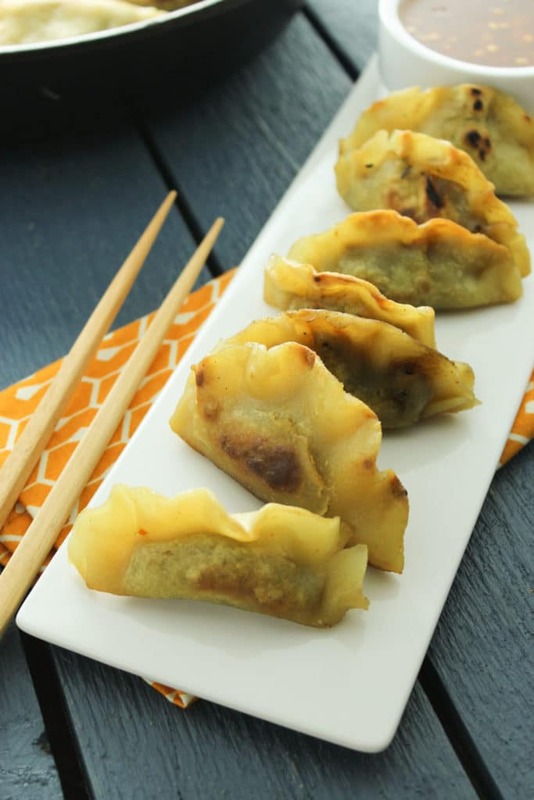 This gluten free potsticker recipe shows you how to make your own perfectly crispy, savory potstickers at home! All you need is need a few simple ingredients and a little bit of patience. I am so excited to share this recipe with you guys. It’s been in the works for a long time now but I wanted to make sure it was just right before releasing it into the great big interweb. Finally here, in all of their adorable, veggie-filled glory, are these perfect gluten-free potstickers. The wrappers only require 3 simple ingredients and the stuff we’re going to stuff ’em with is the bomb. It’s a mixture of 6 veggies in a special sauce that achieves tangy, savory, and spicy magic. Just look at that golden brown, lightly fried crispiness. Yes, please. I’ll have 10 more potstickers, thank you. Full disclosure here – this is not the easiest recipe I’ve ever shared and it’s not going to be the easiest one you’ll ever make. From start to finish, it involves about 2 hours of “work.” Kind of like homemade pizza or sugar cookies, this is a fun recipe that lets you get your hands dirty and gets easier the more times you make it. I have faith in you. You can handle this recipe! 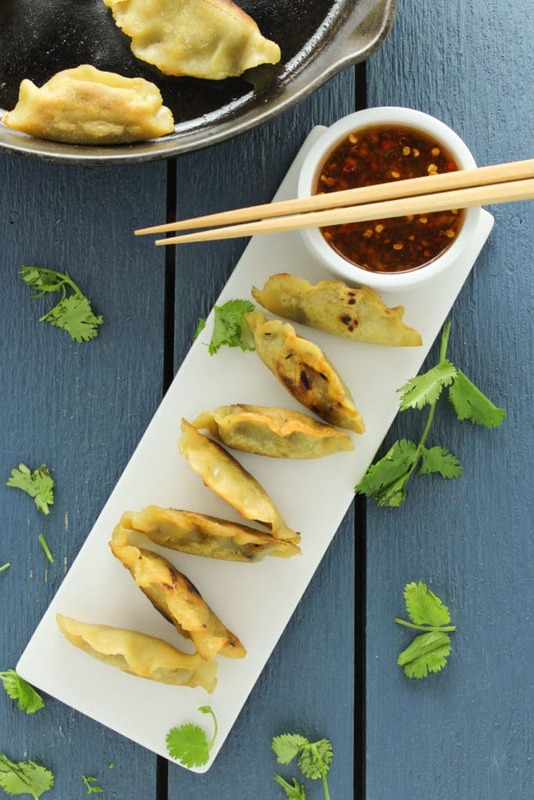 You WILL need a few specific items to create these potstickers. Hello, Amazon! I highly recommend this brand of gluten-free flour for this recipe – it works better than any other brand we tested. And a heavy duty skillet – I love my Lodge cast iron for the job. BUT – If you’re short on time or just feeling lazy, I won’t judge you for using store-bought wrappers and stuffing it with this filling. Scroll past the recipe for some helpful process photos and feel free to comment with any questions! 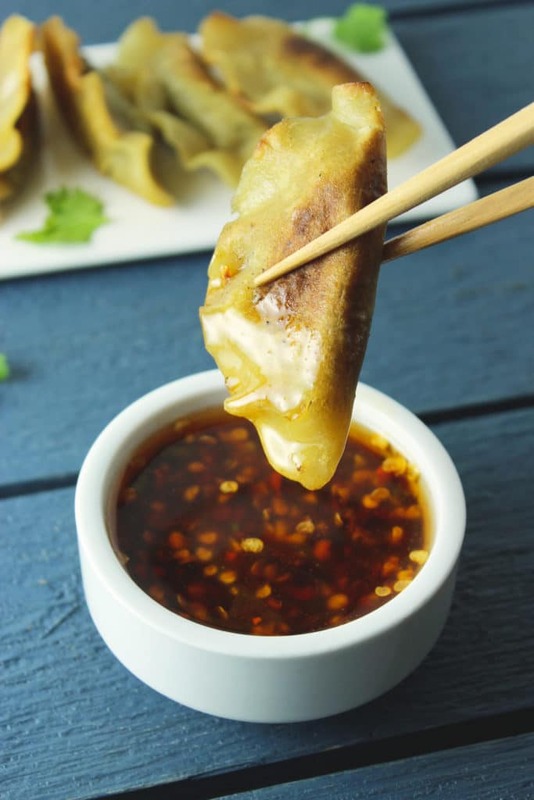 Using just a few simple ingredients, you can make your own crispy, savory, and gluten free potstickers at home! Bring 5-6 ounces of water to a boil. In a medium bowl, whisk together flour and salt. Make a hollow in the center of the mixture. Once water is boiling, slowly pour it into the well that you created in the flour bowl. Stir to incorporate the water. Continue adding water and stirring until the dough starts clumping together. At this stage, it’s time to use your hands. 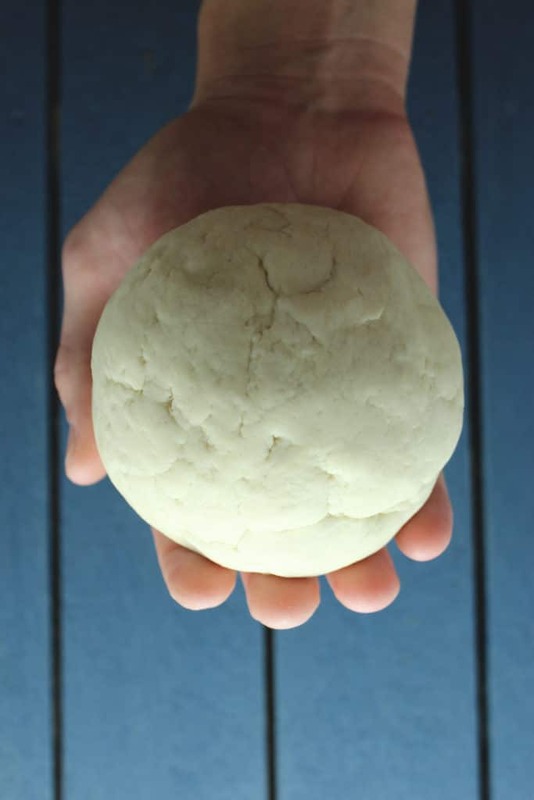 Start kneading the dough until it becomes one solid ball – it should be firm but not crumbly or sticky. Knead on your counter for 2 minutes. Shape the dough back into a ball and wrap it tightly in plastic. Set aside to rest for 30 minutes to 1 hour. Prepare all veggies and spices as instructed above and combine in a large bowl. In a small bowl, whisk together sesame oil, soy sauce, and white pepper. Pour into the bowl with the veggies and mix until well-coated. Set aside. 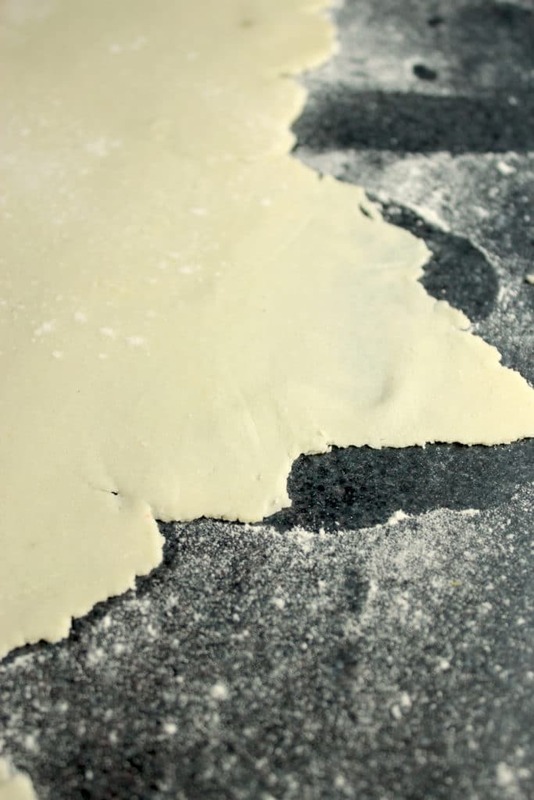 Lightly flour your rolling surface, hands, and rolling pin. 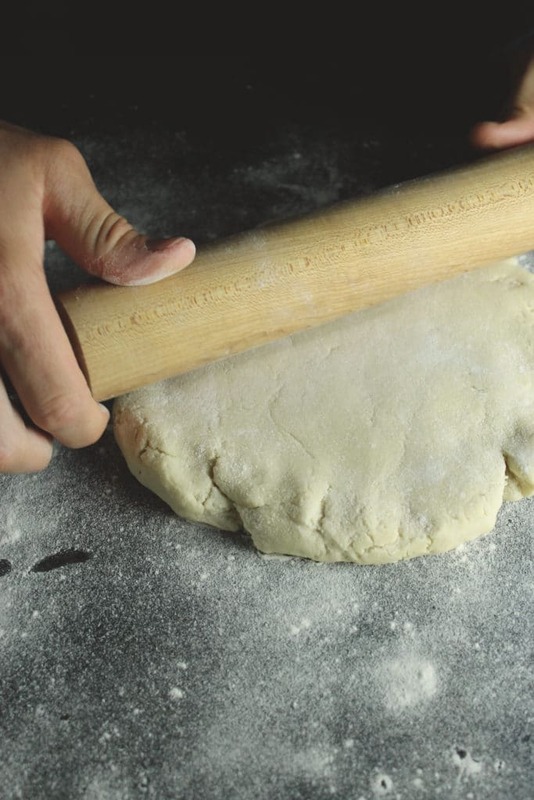 To make rolling more manageable, divide the dough into 4 smaller portions. 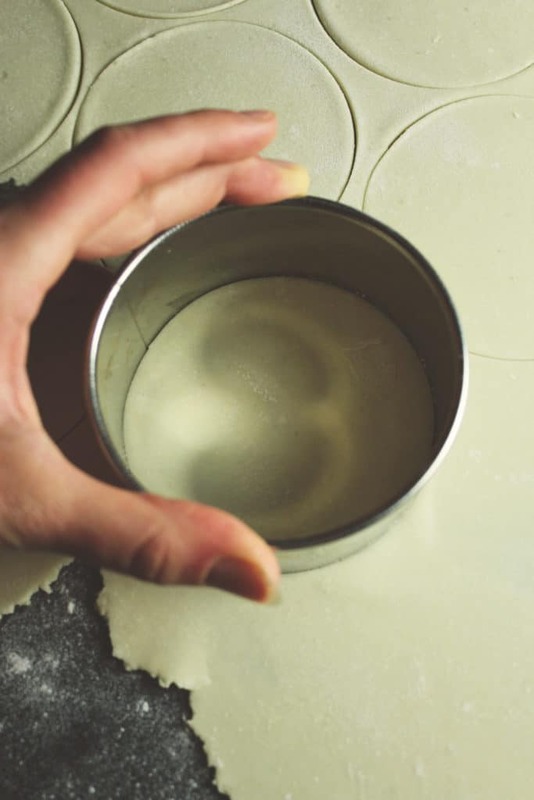 Roll dough until it is as thin as possible without tearing or making holes. You’re aiming for paper thin! Use your cookie cutter to start cutting out the wrappers. Set each one aside for filling later. When you’ve created all the wrappers, fill a small bowl with water. Spoon 1 teaspoon of filling into the center of the wrapper, dip your fingers into the water and wet the edge of the wrapper furthest from you. 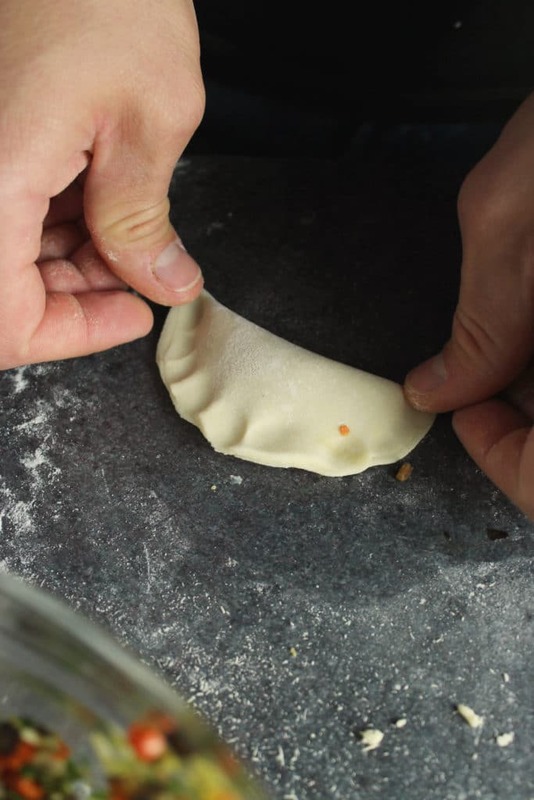 Fold the dry side over and gently seal the edges together, making sure to press all of the air out around the filling. If desired, carefully create pleats with your fingers. Set finished potstickers aside on a tray until you’re ready to fry. Heat 1/4 cup of oil (olive or sesame) in a large skillet to medium heat. Carefully place potstickers into the heated skillet and sauté for 5 minutes. Add 1/4 cup of water and cover to begin steaming. Steam for 10-12 minutes, checking occasionally and moving the potstickers around in the pan to prevent burning. Serve with sauce and dip away! 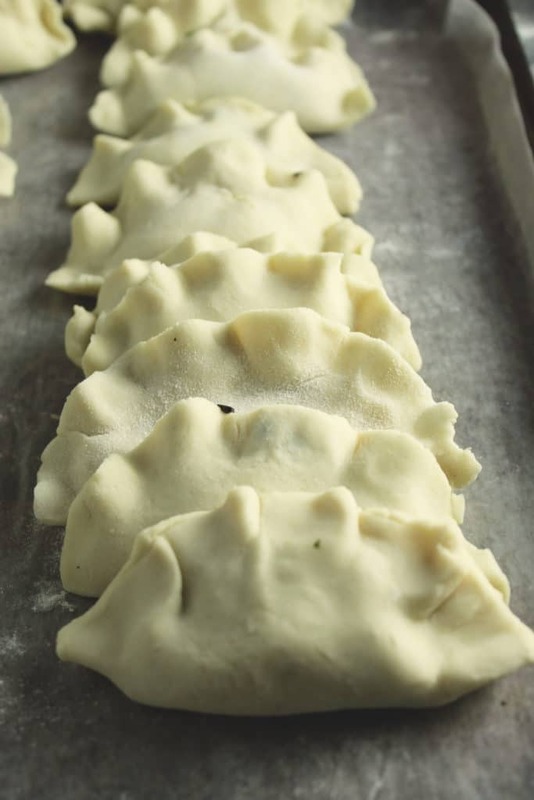 You’ll need a large round cookie cutter or tart form to create the wrappers. The dipping sauce is NOT vegan. But you can use maple syrup instead of honey, or use a different dip entirely. These can easily be frozen for later enjoyment. Just fill a plate with the potstickers and freeze. Once they’re frozen, they can be transferred to a Ziplock and sealed airtight. 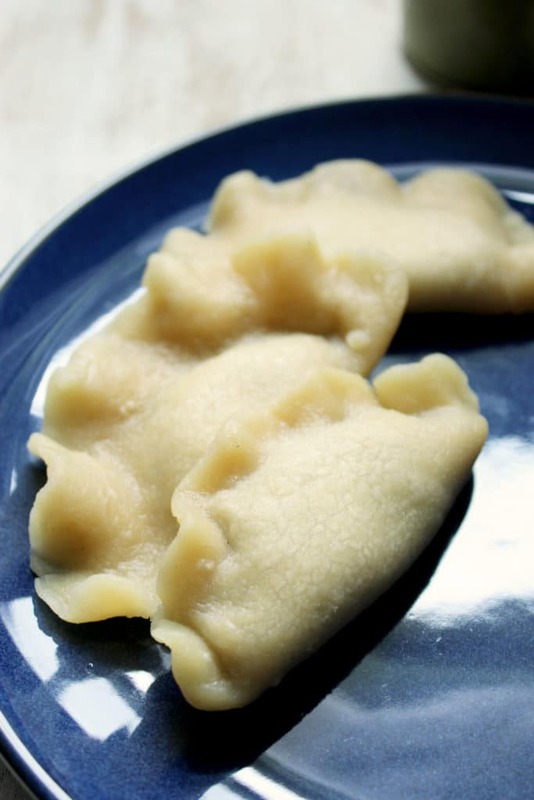 To cook them: boil 6 cups of water and carefully place frozen potstickers into the pot. Boil for 5 minutes, allow to cool, and enjoy! PS – This is how they look after boiling. Is it possible to cook them in broth without them falling apart ? For how long ? Hi Miri! I’ve never tried cooking these in broth so I can’t say for certain. If you try that, please report back with your results! Hi, I just tried this recipe but the dough turned out to be an epic fail! :( it was a firm dough but it cracked easily. I then halved the dough and added more water to it to make it wetter, rolled it out well, but the same problem occurred. What did I do wrong? Hmmm… what a bummer! What kind/brand of flour did you use? I’m be interested to know what kind of GF blend it was! Good morning! I am planning to make the potstickers for dinner tomorrow. Do you know if I can make them today and fry them tomorrow? You can certainly make these ahead of time! I really want to try this, but it looks like Wholesome Chow’s flour isn’t on the market anymore. Is there an alternate mix that you’d recommend? What a bummer! I didn’t realize they went out of business. I would recommend trying Bob’s Red Mill 1 to 1 all purpose flour. Wait… what? You can get store-bought gluten-free Wrappers for potstickers? How has the universe kept this knowledge concealed from me? They might offer gluten-free wrappers nowadays, but this post actually includes directions for making your own at home! This recipe was a hit when I made them for a recent birthday party. I followed the instructions to a tee, and it worked so well. For the gf flour, I used MInimalist Baker’s diy flour blend. I assembled and sauteed the potstickers the day before, then next-day, re-heated them in the oven for a bit just before serving. I plan on making them again this weekend for Thanksgiving (Canadian). Awesome! I’m so glad they were a success for the party! And I’m happy to know that flour blend worked for the dough. Thanks for the feedback! Soy sauce is not gluten free and you need to double check the tamari…it isn’t always gluten free either. The recipe ingredients suggest tamari or soy sauce. If someone is gluten free, they can certainly opt for gluten free tamari. I just made these. I opted for a pork stuffing. The taste was great but the outside turned to mush when i added the water. They seemed to be holding up well in the pan frying part. Any ideas of if I did something wrong? Should I have just pan fried them instead of adding water? Hi Alissa! 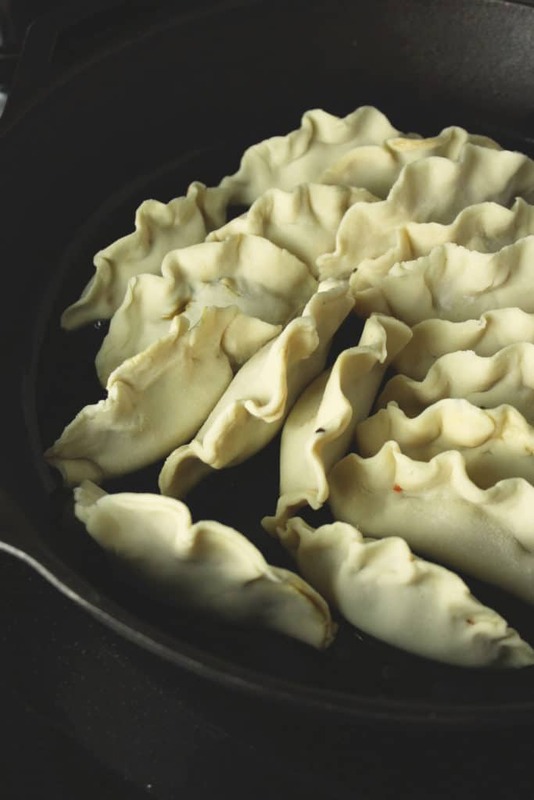 I’ve never tried making these potstickers with a meat filling, so that may have affected the way they cooked. Was the pork stuffing cooked or uncooked? Do you know how I could use almond flour instead? I’m really new to this! Please help!!! I wouldn’t recommend using almond flour for this recipe. I don’t think it will hold together or stand up to cooking. You could certainly test it out, though! I tried it. For all of you out there this DOES NOT WORK! Almond flour can be great, but don’t use it for this recipe. Also a tip… make sure your dough circles aren’t too thin or too thick! Make them just right so you have enough to pinch and they won’t break. Make sure to make the dough circles large enough to fill also. I made mine too small this time so be careful… THEY WILL BREAK! Can’t wakt to taste them! You are a brave soul! Almond flour is definitely not the right choice for these potstickers. Hopefully your other method turned out good! Try cassava flour. It’s great for pasta so should work. Made these tonight and they turned out great! We decreased the sautée time to 3-4 minutes instead. We wished we used about 2 tsp rather than 1 tsp of filling, as they weren’t full enough. We also have about half of the filling left over. The dipping sauce was too spicy and I wish we had only used 1/2 sesame oil and 1/2 olive, as it was too sesame-y. Hi Valerie! I am SO sorry about this. We’re working to get it corrected ASAP. We updated our recipe app this morning and it apparently crashed on us this afternoon. I’ll email you as soon as it’s corrected. I suppose technically I should say 4 veggies or 6 ingredients! Cabbage, mushroom, green onion, and carrot. Sorry for any confusion! Could you bake them in an oven? Hi Thomas! I’ve never tried baking these in the oven, so I have no idea how they would turn out. If you try it, be sure to let me know how it works for you! I tried making the dough for the wrappers three times and three times I failed miserably. The first time the dough was too wet. I used the full 6 oz of water, it came out too sticky and would not roll. The second time the dough came out too dry i used 5/12 oz water that time. I could not get any filling in my wrappers the dough was cracking from being too dry and playable enough. the thirst time I used 6 oz of water and same thing too sticky. Each night I tried my hand a making the wrappers ended the same, me in tears from frustration going to bed hungry. I used bobs red mill gluten free flour for reference. What am I don’t wrong? I am SO sorry that this recipe didn’t work out. Bob’s Red Mill is a very different blend of flours compared to what we used – Wholesome Chow. That probably had a pretty big effect on the consistency of your dough. Bob’s is great for a lot of recipes, but we found that the rice flour blend (Wholesome Chow) works better for this recipe. I hate to hear how frustrated this made you – and I hope you will have better results! When I’ve had problems, I found it was due to the water not being hot enough. The heat is really important in activating the sticky starches. The difference between hot and boiling water is massive. Seems like there is some confusion here. To clear things up: soy sauce isn’t gluten-free (I’ll have to check on Kroger’s brand to know for sure, but I thought that something about the process of making soy sauce made it non-gluten-free). Honey isn’t vegan, but bee-free honey (really good!) and brown rice syrup are good alternatives… or just sugar (processed WITHOUT bone char, of course, as many white sugars are). Store-bought egg roll wrappers/wonton wrappers generally aren’t vegan (eggs) OR gluten-free but health food stores near you may carry ones that are vegan and/or gluten-free. Tamari is a gluten-free alternative to soy sauce–it’s really a lot like soy sauce, often almost identical-tasting, but the process used to make it leaves you with a gluten-free product (incidentally, it wasn’t designed to be gluten-free, it just is). And you can use the other things like Bragg’s liquid aminos, coocnut aminos, etc. as others mentioned in place of soy sauce, but tamari or Bragg’s liquid aminos are going to be best for an end product that tastes like it was made with soy sauce. Hope that helps some folks! There seems to be a lot of back and forth on this topic, thanks for your input! I generally use tamari, unless I cannot find any and I’m in a pinch. LaChoy has always been gluten free. It says it right on the label. These look absolutely delicious! I’m a naturopathic doc and help people identify their food sensitivities. Since those sensitivities are often to dairy, gluten and eggs I’m always on the lookout for tasty gluten free, vegan recipes to share with my patients and online community. 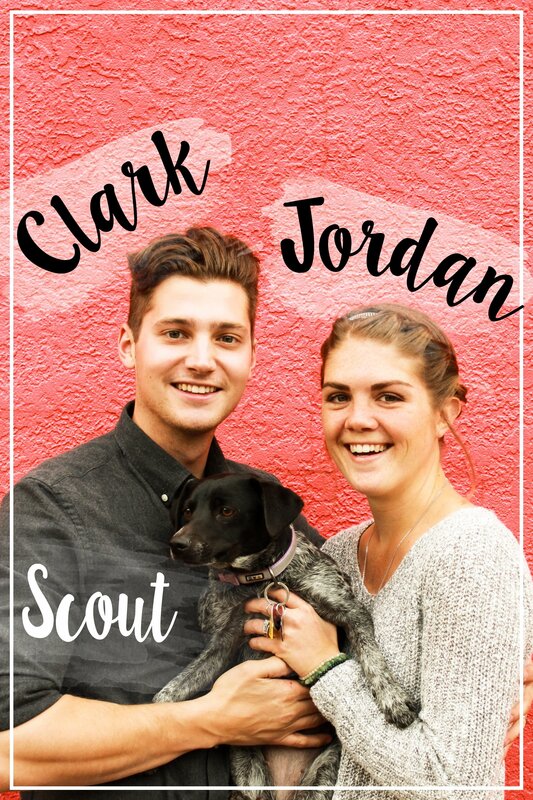 I’m sharing this to my pinterest page and Facebook page now! Thanks again guys :) Can’t wait to make a double batch!! Kroger store brand soy sauce is gluten free. Any suggestions or idea of how these may work in egg roll wrappers versus the wrapper recipe you’ve provided? I have the egg roll wrappers on hand hence why I am curious of thoughts! That’s a great question! 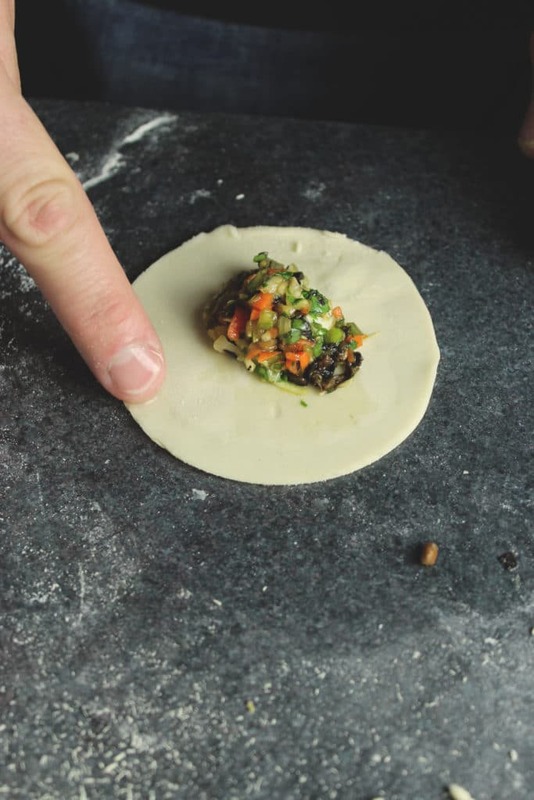 The filling should work fine in egg roll wrappers – and I assume you could cook them the same way OR bake them. If you try, let me know how it works! If you roll into a big square, you can cut into wonton wrapper size squares, about 3×3, with a pizza cutter. Fold into triangles when you stuff. Much faster and no wasted dough. Keep a damp paper towel over your stack of wrappers so they won’t dry out before you finish stuffing them. We do that even with store bought ones. I am confused with the fry/ steam….. I fry and then add water to the oil???? Isn’t that going to make them soggy? And adding water to oil???? Dangerous? I know it seems counter-intuitive, but trust me – it works! The quick sear adds a crisp and the steaming cooks the filling. I was hesitant to try the method as well, but it works like a charm. I just made these with store bought won ton wrappers and they were amazing but I had to add almost 5 tbspoons sweet pickle juice to make the stuffing edible. It was wayyyyyyy tooo SALTY before. I tested the mix before putting in wrappers and was almost toooo much to even eat, so I added sweet pickle juice till it was edible and fried a few of them up to test and they were awesome! I recommend taking the soy sauce down to about half suggested and test first. These are fried first and then steamed after….but for how long? ?….Thank You for sharing this recipe. I was wondering the same thing. Wouldn’t it make the mushy? Do they hold up to freezing and boiling? It is Chinese New Year and here in China they are boiled not fried. Also I usually dip in a vinegar sauce not soy sauce. So that is another option. I am hoping these work so I can have Jiaozi for CNY. Thank you for the recipe. I love vinegar and chili oil as a dip for these!! Great recipe! I did use a tortilla press so my wrappers were very thin. Not as pretty as yours but they were SO good. Thank you for giving me something back I thought I could not have! Worth the time. These look fabulous! I haven’t had much good luck with gf baking and wondered how well the wrappers would hold up but based on the comments I will def give these a try. Thank you for sharing! Best of luck, Jean! GF cooking can be a little tricky sometimes, no doubt. I highly recommend using Wholesome Chow’s all purpose mix for these. 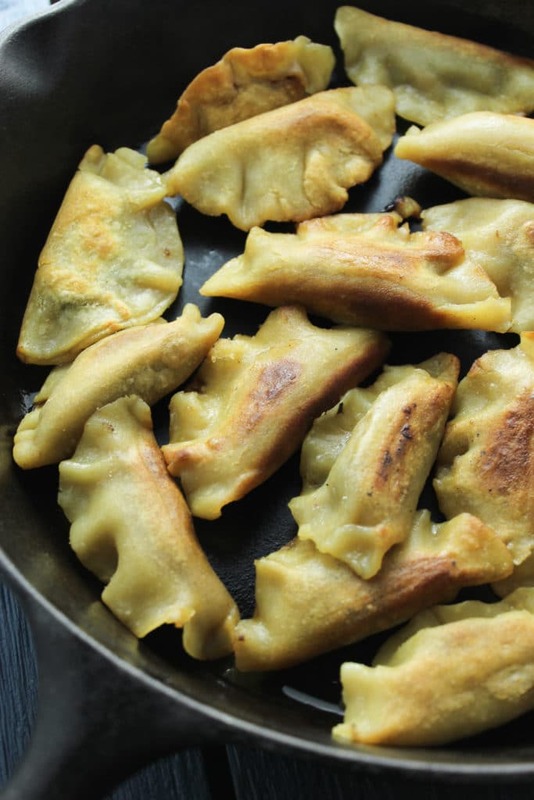 How many potstickers does this recipe make? But honey is not vegan? You’re correct! 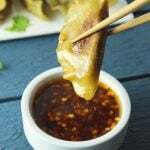 Luckily, though, the potstickers themselves do not contain honey – just the optional dipping sauce. It could easily be swapped with brown rice syrup or maple syrup. Or, you could use a completely different dip if desired! They’re great with soy sauce and sriracha. Does the gluten free all purpose flour have xantham gum in it? Yes, it does have xanthin gum in it. That’s one reason why I love Wholesome Chow’s mix! I really miss eating these. This recipe looks really easy and very yummy! They’re such a great alternative for gluten-free eaters. Hope you enjoy! Cilantro is great in the filling too. I see you have it decoratively arranged in your beautiful photos! Great recipe! Nope! The filling is uncooked. It just gets mixed together and spooned into the potstickers. to freeze them: do you cook them first in the oil, freeze them, and then boil? Or do you freeze them uncooked, and the boiling is what cooks them? You freeze them uncooked, and boil them from frozen. Hope that helps! Thank you!! I was wondering the same thing! This was delicious! We used a Bob’s Red Mill GF flour. Was great. I used the food processor to chop everything up in small pieces and it made for super fast prep. We didn’t use any oil in the filling and cut back by 1/2 in the dipping sauce because the oil separated and sat on the top and took away from the other lovely flavors in the sauce. We had to cut back on the red pepper because it was too much for us. Have no idea is right for others. The potstickers were really tasty and we are definitely making again. Thanks so much! Thanks for the info, Karen! We use San-J as well. Ohh they sound tasty and a lot better price than the $8 for 6 of them I’ve seen at the store that turned out terrible. I may have to make a bunch of these for easy meals in the future! Have you tried pan frying them after frozen? Trader Joe’s makes a good potsticker and there are a lot in the bag and reasonably priced. yes these look good and I do plan to try them because my daughter can’t eat gluten without getting an upset stomach. Trader Joe’s has gluten free potstickers? I wasn’t aware that they had them until another commenter mentioned it! I’ve never seen them. Where do you buy the Wholesome Chow gluten free flour? Thank you.